If you're a fan of Deep Work by Cal Newport, Jordan B. Peterson's 12 Rules for Life or The Subtle Art of Not Giving a F*ck by Mark Manson; you will love The End of Procrastination: How to Stop Postponing and Live a Fulfilled Life. Take control and stop procrastinating: Even with overflowing inboxes, thousands of unread notifications, and unmet deadlines, most people still can't manage to take control of their time and stop procrastinating. The End of Procrastination tackles this ubiquitous problem head on, helping you stop putting off work and enabling you to reclaim your life. Transfer the knowledge of neuroscience and behavioral economics into practice: Author Petr Ludwig is a science popularizer, entrepreneur, and consultant with the gift of being able to explain crucial and difficult things simply and easily. Adela Schicker is a personal growth consultant and motivational speaker. Petr and Adela are the co-founders of Procrastination.com, which has helped Fortune 500 clients in Europe overcome the habit of putting off tasks and responsibilities. Now, in their book The End of Procrastination, Ludwig and Schicker offer a blueprint for improving your intrinsic motivation, efficiency, and happiness at work and in your personal life. A science-based toolset: Based on the latest research, The End of Procrastination synthesizes over one hundred scientific studies to create a program that is based on the way our brains actually work. By understanding exactly why procrastination happens and how our brains respond to motivation and self-discipline, the book provides readers with the knowledge to conquer procrastination on an everyday basis. Petr Ludwig (age 32) is a science popularizer, entrepreneur, and consultant of Fortune 500 companies across Europe. In his book and talks, he transfers into practice the knowledge of neuroscience and behavioral economics. Petr has worked with companies such as Cisco, KPMG, HP, Dell, Microsoft, IBM, Pepsi and Deloitte. He is CEO of GrowJOB Institute which applies the latest scientific findings in neuroscience and behavioral economics to individual and workplace development. GrowJOB leverages its expertise to overcome procrastination in business environments and to improve team motivation and commitment at work. 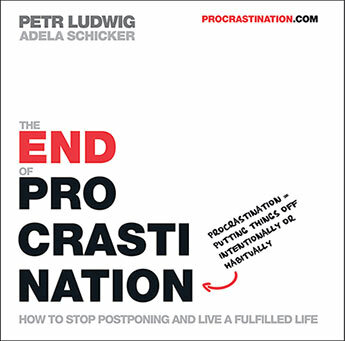 Adela Schicker is the cofounder of Procrastination.com, the institute that helps companies and individuals to reach their full potential. Adela translated this book and is helping it to reach an international audience. She speaks at conferences and training companies worldwide, making sure that science can be explained simply and made useful for everyone.